My morning cup of milk came with a mint fresh news (late last night i was looking at adsense and adwords) - Google releases Google Trends. 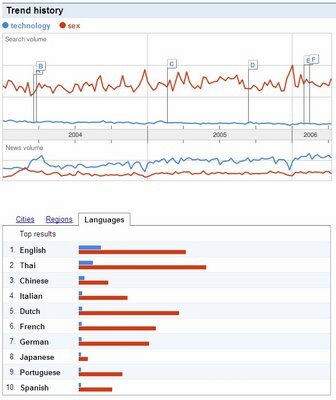 in here, the blue trend line is search for microsoft technologies and is at the top! clearly Microsoft technologies (development, operating system, servers, games) etc create the most buzz. 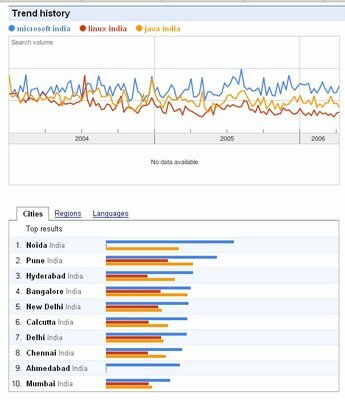 Noida is from where the maximum search comes out - Bangalore is much lower at 4th place. Conclusion - Microsoft has captured maximum interest in New Delhi/ NCR! Java is much ahead when compared to .NET! Ergo most interest is around Java (notice the comment about availability of documentation with .NET technologies).. Since this was a world-wide search, maximum interest in development technologies is coming from India - "The World's Developer Nation!" 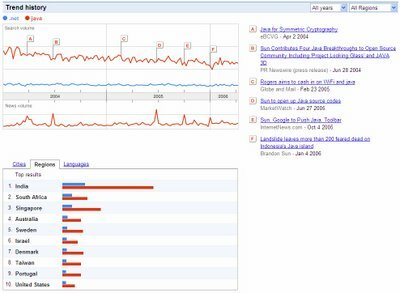 you can know more about tweaking search on Google Trends.